The one and only dedicated weight loss blog in Singapore. By a guy who lost almost 20kg in 2months. Sharing his experience for free. Contact me if you want to achieve it. 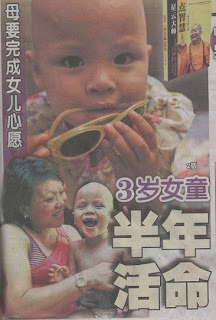 3 year old girl with rare last stage liver cancer, doctors commented that she only has 6 months to live, however her mum vows not to give up, and will carry on the fight with her daughter to the end. The girl, Putri, is the youngest child in the family. She has 4 elder siblings, a 19 year old brother and 3 other sisters 14 years old, 12 years old and 10 years old respectively. 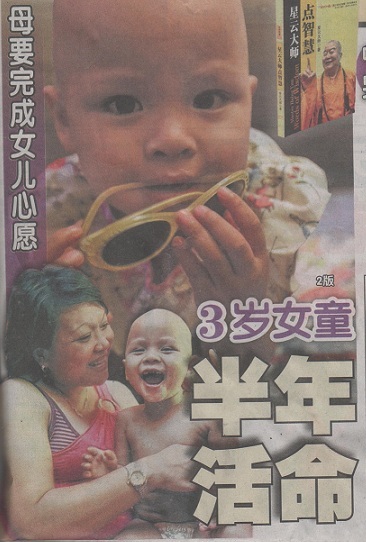 When interviewed, Putri’s mum (44 years old) mentioned that Putri was born healthy, but suddenly lost her appetite when she was 1 year old, and her stomach became bloated. From the results of lab tests, doctors discovered that Putri had developed a rare cancer named Neuroblastoma, with a 20% chance of survival. She was very touched and relieved at the moment, and Putri underwent 13 rounds of Chemotherapy. 14 months later, Putri was finally discharged, but still require to go back to hospital once every 2 weeks for oral medication. She mentioned that after 6 months of treatment, Putri’s condition was stabalised, and further lab report indicated that there were no more cancer cells. However, unexpectedly, during a visit to the hospital on 29 May 2012, Putri was diagnosed as having a recurrence of her cancer condition, with only 6 months to live. If Putri carried on with Chemotherapy, she will become weaker and weaker, so her Chemotherapy will be discontinued soon. Neuroblastoma is a rare liver cancer, 1 out of every 100,000 child will develop this condition. If left untreated, the child will die in 3 to 6 months. To take care of Putri, the mum fainted due to fatigue, and after Putri’s cancer recurrence, she lost 15kg in 1 month. During the period when Putri was in coma, Putri’s mum only slept up to 3 hours a day, with only about 10 hours of sleep a week, and fainted due to fatigue. After Putri started taking oral medication, to avoid Putri’s face from rubbing against the pillow and further aggravating her bleeding, the mum will carry Putri in her arms when she sleep. She mentioned that she was so depressed over Putri’s condition and lost 15kg in a month. Putri’s mum divorced during her pregnancy, raised her 5 children on her own, and depleted her savings. As she needs to take care of Putri, she was unable to work, only relying on assistance from charities. To fulfil Putri’s last wishes, her mum plans to bring her on a trip to Universal Studio as well as fly her on a plane around Singapore. While she believes Putri has great fighting spirit, she will try to fulfil her wishes, and let her be happy at all times. Allow Putri’s main wish is to tour Disneyland, this is a difficult task to fulfil, that’s why she intend to bring Putri to Universal Studio. On top of that, charity organisation such as Children Cancer Foundation will assist her, to charter a private plane to fly around Singapore. 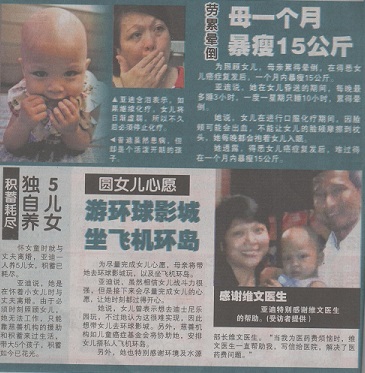 She is also grateful to Minister for the Environment and Water Resources, Dr Vivian Balakrishnan for helping her draft a letter to the hospital, when she is troubled by the mounting hospital bills. Thanks so much and I'm taking a look ahead to contact you. Will you kindly drop me a e-mail?